The Indian Space Research Organisation (ISRO) has recently announced that its first solar mission, named Aditya-L1, will be launched in 2019–20. The spacecraft aims to answer fundamental questions in solar physics by studying dynamic processes on the Sun. It is slated to be launched into space from the Satish Dhawan Space Centre in Sriharikota, atop a PSLV-XL rocket. The mission, introduced in 2008, was initially planned to be launched by 2015–16 and was designated Aditya-1. The original project envisioned the mission as an 882 lbs (400 kg) satellite that would be placed into low-Earth orbit (LEO) at an altitude of about 500 miles (800 km). Now, it is expected to be injected into the halo orbit around the Lagrangian point L1 of the Sun-Earth system; thus, the mission was renamed to Aditya-L1. Located approximately 930,000 miles (1.5 million km) from Earth, L1 is a great spot for continuous observations of the Sun without any occultations or eclipses. The position of L1, outside Earth’s magnetic field, makes it an excellent outpost for in-situ measurements of incoming charged particles from the Sun. According to ISRO, placing a spacecraft at this spot will enhance the technical prowess of the Indian space program. The probe is expected to reach L1 after a journey lasting about 100 days. The probe will be probably based on India’s homegrown I-1K (I-1000) bus. It will consist of two deployable solar arrays and will most likely feature seven scientific instruments. The Visible Emission Line Coronagraph (VELC) will study the diagnostic parameters of solar corona and dynamics and origin of coronal mass ejections (CMEs) in one infrared and three visible channels. 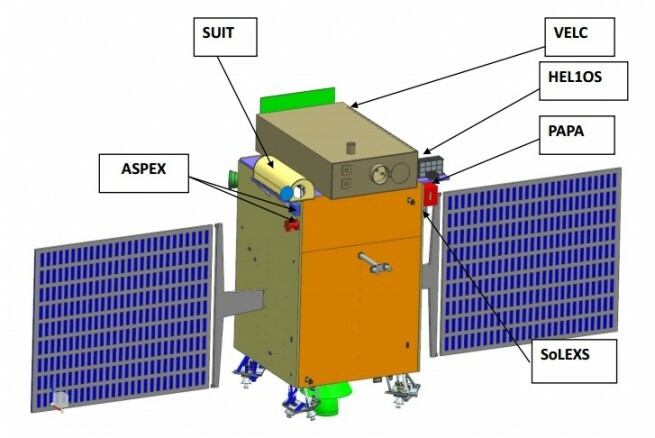 To investigate dynamics of the solar atmosphere, the spacecraft will be equipped in the Solar Ultraviolet Imaging Telescope (SUIT). It will be able to image the spatially resolved solar photosphere and chromosphere in near ultraviolet and measure solar irradiance variations. Next important instrument is the Solar Low Energy X-ray Spectrometer (SoLEXS). It is expected to monitor X-ray flares for studying the heating mechanism of the solar corona. The Aditya Solar wind Particle Experiment (ASPEX) will study the variation of solar wind properties as well as its distribution and spectral characteristics. It should determine the variation of the spectrum of solar wind ions, suprathermal ions, and solar energetic particles during the solar cycle. The main task of the Plasma Analyser Package For Aditya (PAPA) is to understand the composition of the solar wind and its energy distribution. Data from this instrument would provide detailed knowledge of the solar wind condition with high time resolution. Aditya-L1 will also carry the High Energy L1 Orbiting X-ray Spectrometer (HEL1OS) to study hard X-ray emission during the impulsive phase of solar flares. The spacecraft may be also equipped with a magnetometer to measure the magnitude and nature of the interplanetary magnetic field. However, no detailed information yet has been disclosed by ISRO about this instrument. According to Indian Minister of State in the Prime Minister’s Office Jitendra Singh, the approved cost of Aditya-L1 is around $55 million. The spacecraft is expected to be operational for up to five years.